Glencoe rightly tops the list of many outdoors aficionados, with its towering mountains enclosing a spectacular 16km (10-mile) road stretching from King’s House in the East where the glen starts to drop down from Rannoch Moor, to Glencoe village in the West, with Loch Leven opening out a watery vista. 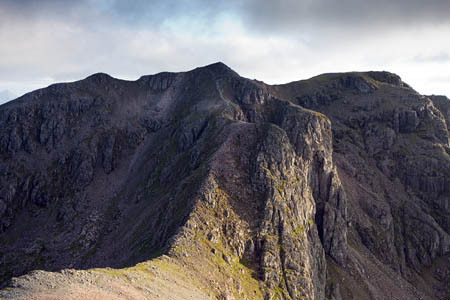 This route is not a gentle stroll, and anyone tackling this walk, taking in three separate 1,000m peaks, will fell the burn in the legs and the pressure on the lungs. The terrain is complex in parts which, in mist, will require attention to navigation. In fine weather, the views are extensive and impressive, and peak-spotters can have a field day putting names to mountains near and distant, including the biggest of all, Ben Nevis, clearly visible to the North. Some glens are blessed with remoteness and tranquillity; not Glencoe. 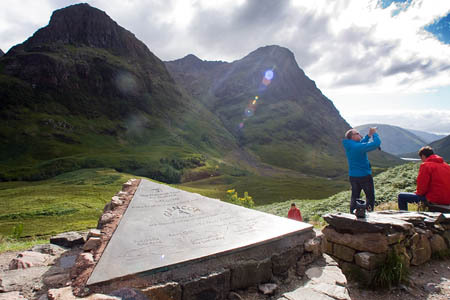 Expect to share the layby with coachloads of tourists posing in their best, unused Gore-Tex as numerous camera-phones point to the imposing Three Sisters and, less noticed by the non-outdoor cognoscenti, Aonach Eagach. The walk starts at one of the laybys just west of Allt-na-Ruigh, which on Ordnance Survey’s 1:50,000 maps is spelt Allt-na-Reigh, the white cottage owned by the late Sir Jimmy Savile, who would wave regally at passers-by when in residence and which is, at the time of writing, reported to be intended as a retreat for disabled people. There is a small layby on the north side of the A82, with two larger ones a couple of hundred metres west, on the south side of the main road. The middle layby has an adjacent helipad. Hopefully you won’t be needing the services of the search and rescue aircraft. Paths lead down from the laybys to join the main path heading for the wooden bridge over the River Coe at NN 167 566. After crossing the river, the path heads slightly to the right to ascend into Coire an Lochan, with Aonach Dubh on the right and Geàrr Aonach on the left. 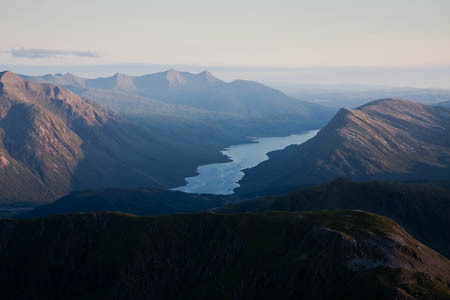 These, two of the Three Sisters, are the truncated fingers emanating from the ridge of Bidean nam Bian. Our route goes up one of the corries separating the fingers, and down the other – the Lost Valley reputedly used by cattle-rustling MacDonalds to hide their ill-gotten livestock after their repeated raids on the rival Campbell clan. The climb, on a rocky path sometimes negotiating slabby rock sections, is steady and relentless. 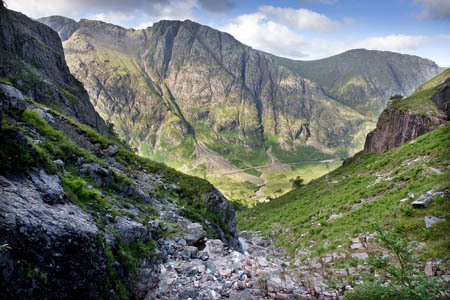 However, pauses to look back towards Glencoe and Aonach Eagach are recommended, as the imposing ridge along the north side of the glen displays the deep gullies indenting Am Bodach, the eastern peak of the Aonach Eagach. The path eventually turns left to circumnavigate a waterfall, then levels out a little into the upper corrie itself, which is populated by several lochans, which give it its name. The path again heads slightly left, as a headwall blocks further straightforward progress. The path peters out, so strike out up the part-grassy, part-scree slope to gain the north-east ridge of Stob Coire nan Lochan. Further scrambling follows over easy rocks as the ridge curves round to the right, including the most exposed section of the whole route, the short climb up on to the summit of the munro-top, though there is nothing beyond the ability of a hillwalker with a reasonable head for heights. The summit has a small pile of stones to mark its top. If weather permits, take time to take in the vista, which is extensive and hugely impressive: real mountain scenery all around. 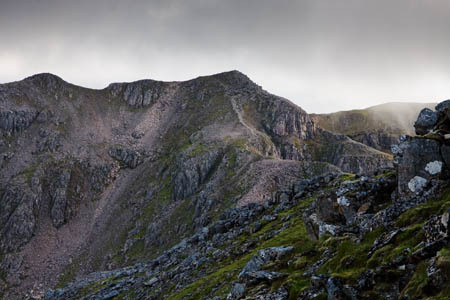 In good weather the route to Argyll’s highest peak is obvious, dropping down steeply to a col before a rocky rise to the complex summit, with its two large buttresses thrusting northwards towards the Coire nam Beitheach. The ridge up to its summit looks far worse than it is, and the climb from the bealach, though steep, has no technical difficulties and, in its upper reaches, is marked by a path. The rounded top of Bidean nam Bian, the 1,150m munro, is again marked by a small pile of stones and once more the fabulous mountain vista can be admired if weather permits. 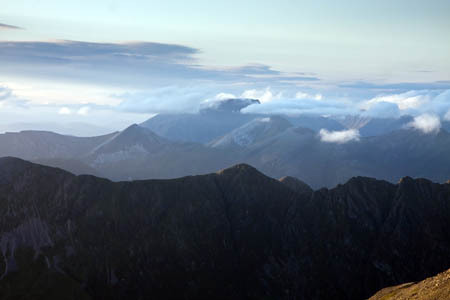 Savour the view from Britain’s 23rd highest mountain. If you have the energy, a detour at this point can be made to the summit of Stob Coire nam Beith, 500m to the North-West and 50m or so of extra ascent. Otherwise, head roughly south-east towards the Bealach Dearg, with the second munro of the day in your sights. As you reach the col, make note of the low cairn marking the descent down a short chute-like route that will form our eventual route down into the Lost Valley – the Coire Gabhail. Gird your loins for the final climb of the route up the broad ridge to the rocky summit of Stob Coire Sgreamhach. 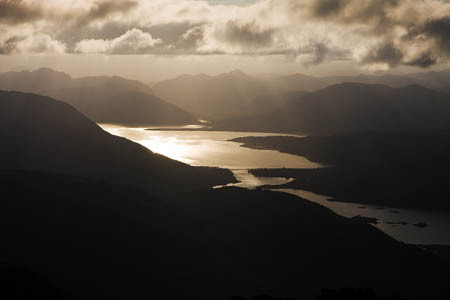 The views south to Loch Etive are particularly fine, with Ben Cruachan’s pointed peaks visible at the foot of the loch. 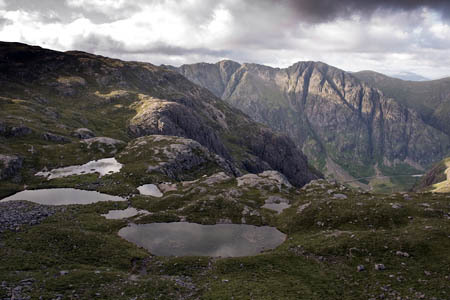 Enjoy the final views from the munro before retracing your steps to the Bealach Dearg, which actually is the very reddish-brown colour its Gaelic name would suggest. Negotiate the awkward 20m or so at the top of the route off into the corrie then pick out the least rocky route down the steep head of the corrie, heading slightly left to pick up eventually the path that leads all the way down lower north-western slopes of this long valley, with the tumbling waters of the Allt Coire Gabhail cutting a deep ravine to your right. The path sticks to the left flank of the long corrie before it reaches the flatter floor a few hundred metres short of its drop down back towards Glencoe. I chose to tackle the route in a summer evening, and by the time I hit the Lost Valley it was time to start looking for a wild campsite. 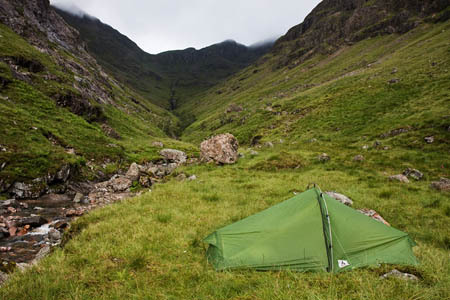 These are in definite short supply higher up the corrie, with its steep sides, but as the land flattens there are plenty of good grassy sections to pitch a tent just short of the broad rocky area leading to the wooded area and the huge boulders at the north-eastern end of the valley. By morning, the sun was attempting to exert itself as I made the drop through the bouldery exit of the valley, crossing the Allt Coire Gabhail to pick up the path on the western side of the burn to reach a fence and gate. Normally the route continues through the gate to cross the River Coe at the Meeting of Three Waters but bridge maintenance by the National Trust for Scotland meant a diversion across boggy terrain to the west to pick up the path from the Coire nan Lochan once more. A retracing of steps over the river bridge and the path back to the laybys brings the walker once more into tourist land as the coach tours make their five-minute stop to make a digital record of some of the finest mountain scenery in the western Highlands. Bask in the knowledge you have encountered the mountains at close range, an experience few of them are likely to enjoy. The laybys warn of the danger of landslides and a prohibition of overnight parking but, following my wild camp in the Lost Valley, I had neither a boulder nor a parking ticket on my windscreen. In winter conditions, this would be a serious, long undertaking advisable only to those with the skills, equipment and stamina for a big winter day out. Mapping and the route for this walk can be found on grough route for subscribers. Key in grough 2012-8 to a route search. Note: grough routes should be used in conjunction with maps, a compass and other navigational aids. Knowledge of and competence in using a map and compass is essential when using the routes. Carry the correct equipment for the conditions and be aware of hazards in the outdoor and upland environment. The "No Ovenight Parking" signs have now been blanked out on these laybys after a recent court ruling stated it was putting tired drivers lifes at risk. The ruling found that drivers were being denied the chance of resting up for a few hours when tired and driving through the night. Let's hope that people use the new flexible approach sensibly and we do not see a multitude of caravans and campervans setting up camp in these rest areas. Nice walk description, however in winter I'd recommend ascending Stob Coire nan Lochan via the Gearr Aonach shoulder rather than the Pinnacle/South Buttress. The latter has a tricky oversized boulder scramble to the summit which can be extra problematic when snow-covered. Similarly, if the Bealach Dearg is corniced and preventing a descent into the Lost Valley then I'd advise heading off Stob Coire Sgreamach to the SE and dropping into the Lairig Eilde from lower down on the ridge. You'll end up back on the A82 at the Buachaille Etive Beag parking area, but there is a path on the northside of the main road which heads west the short distance back to the Three Sisters laybys. Can I suggest you remove the refernce to Jimmy Saville in this write up. The previous occupant Mr MacInnes might be a better link.